Aanvullende compilatie van wetenschappelijke artikelen omtrent de mimicry in symptomen bij een koper deficiëntie dan wel een Vit.B12 tekort in de breedste zin van het woord. Met name de specifieke overeenkomsten wat betreft de symptomen en uiteindelijke identieke gevolgen van een koper tekort met een Vit.B12 deficiëntie zijn op zijn minst frappant te noemen. De hematologische afwijkingen bij een koper anemie laten zich door aanvulling van koper suppl. in de regel corrigeren. Verlichting in klinische symptomen van een koper deficiëntie, net als bij een Vit.B12 deficiëntie, wordt bepaald door de ernst van het voortschrijdende tekort wat mede bepaald in hoeverre de klachten omkeerbaar zijn. Citaat: Bij de behandeling van ernstige neurologische stoornissen ten gevolge van vitamine B12-gebrek worden tijdelijk onderhoudsdoses één- à tweemaal per week toegediend. 'Aanslaan' van de therapie blijkt onder andere uit daling van de plasma-ijzerspiegel binnen 24 uur na de eerste injectie, vijf etmalen later gevolgd door de zogenaamde reticulocytencrisis. De toediening van hydroxocobalaminen heeft onvoldoende effect als er naast de vitamine B12-deficiëntie tevens een tekort aan foliumzuur of ijzer bestaat. Verhoogd gebruik van Vit.B12 (met name langdurig met een kort interval injecteren) en inname van ijzer en foliumzuur trekken een wissel op de kolenvoorraad. Vit.B12 patiënten met een coëxisterende ijzer deficiëntie die na langdurig met een kort interval B12 injecteren, eventueel in combinatie met ijzer suppl. (zonder serologische respons), en die onvoldoende herstellen of zelfs achteruit gaan dienen bedacht te zijn op het feit dat dit het gevolg kan zijn van een koper anemie, veroorzaakt door de ingestelde therapie. Vit.B12 therapie kan de anemie en neurologische stoornissen die behoren bij een Vit.B12 deficiëntie corrigeren. Ongelukkigerwijs kan Vit.B12 geen neurologische stoornissen corrigeren in het zenuwstelsel die het gevolg zijn van een koper deficiëntie. Permanente zenuwbeschadiging kan voorkomen wanneer een koper tekort niet wordt behandeld. Het precieze type anemie Vit.B12 of koper dient strikt genomen goed te worden onderzocht c.q. bepaald. Van belang hierbij is een nauwkeurig serologisch (bloed) onderzoek welke type anemie van toepassing is. 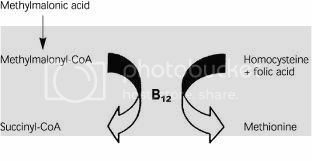 Citaat: Copper deficiency can co-exist with vitamin b12 deficiency because copper is absorbed in the stomach mucosa. The clinical picture is of copper deficiency is similar to vitamin B12 deficiency. Patients with present signs and and symptoms of pathology that primarily involve the posterior columns and lateral corticospinal tracts. Predominant complaints include paresthesia in the feet, ataxia, and limb weakness. Similarly to B12, neurologic symptoms in copper deficiency-myelopathy are not always associated with hematologic abnormalities. Some patients may have low-normal B12 levels and may be diagnosed with B12 deficiency; despite the treatment with B12 supplementation and normalization of MMA and Hcy, these patients can continue to deteriorate and the neurologic symptoms may only stabilize or improve following copper supplementation. Citaat: Myelopathy and peripheral neuropathy are the most common neurological manifestations of cobalamin deficiency. Early diagnoses and treatment are crucial because the neurologic deficit can be permanent in advanced stages......Other conditions mimicking vitamin B12 deficiency, especially copper deficiency, should be ruled out. Citaat: The clinical and radiological findings were reminiscent of subacute combined degeneration of the cord, and although B12 levels had been repeatedly normal, functional B12 deficiency was considered possible and B12 replacement was initiated. Concurrently, a literature search using the terms ‘subacute combined degeneration’ and ‘myelodysplasia’ led to case reports of copper deficiency. The patient’s copper and caeruloplasmin levels were found to be undetectable, thus confirming a copper deficiency state. Citaat: Despite the recognition of copper deficiency as a cause of anaemia and neutropenia for over 30 years,1 there is still limited awareness of copper deficiency as a cause of cytopenias. The anaemia is most commonly macrocytic, but may be normocytic or microcytic. Thrombocytopenia is rare.2 Bone marrow assessment often shows morphological characteristics suggestive of myelodysplastic syndrome, such as ring sideroblasts and nuclear maturation changes of erythroid and myeloid precursors. Citaat: The hematologic manifestations of copper deficiency are well known . It is only in recent years that the neurological manifestations of acquired copper deficiency in humans have been recognized [2–12]. The most common manifestation is that of a myelopathy presenting with a spastic gait and prominent sensory ataxia [2, 5–12]. Central nervous system (CNS) demyelination , peripheral neuropathy , and optic neuritis  have also been recognized. Often, the cause of the copper deficiency is unclear. The neurological syndrome may mimic the myeloneuropathy of vitamin B12 deficiency . Copper and vitamin B12 deficiency may coexist, and the neurological syndrome may be present without the hematological manifestations . The response of the anemia and neutropenia to copper supplementation is prompt and complete. Somatosensory-evoked potential and nerve-conduction studies suggest impaired central conduction and varying degrees of peripheral neuropathy. Following copper supplementation, further neurological deterioration may be prevented; however, improvement is slight and often subjective. Citaat: Acquired copper deficiency presents with a spastic gait and sensory ataxia. Spinal cord magnetic resonance imaging (MRI) in patients with copper deficiency myelopathy may show increased T2 signal, most commonly in the dorsal midline cervical and thoracic cord. These imaging findings may be reversible with normalization of serum copper. The clinical and imaging picture is very similar to the subacute combined degeneration seen in patients with vitamin B12 deficiency. Neuroradiologists should consider this possibility when a long segment of symmetric dorsal spinal cord T2 hyperintensity is identified. Citaat: The electrolytes, liver enzymes, glucose, thyroid stimulating hormone, fatty acid profile, vitamin B-12, folic acid, homocysteine, methylmalonic acid, vitamin E, serum protein immunoelectrophoresis, serum protein immunofixation, angiotensin converting enzyme, free fatty acids, and arylsulphatase A were all normal. Citaat: The serum copper level was markedly low at 7 mg/dl (normal 70 to 155), as was the serum caeruloplasmin, at 2.1 mg/dl (normal 22.9 to 43.1). Serum zinc was raised at 2.28 mg/ml (normal 0.66 to 1.10). The patient’s zinc supplement was inspected. Each capsule contained 50 mg of elemental zinc in the form of zinc gluconate. The recommended dosage, according to the label, was one capsule daily (333% of the recommended daily dose of 15 mg). The patient described taking four to eight capsules daily; she would increase the dose according to the severity of her symptoms, ingesting up to 400 mg/day. A diagnosis of zinc induced copper deficiency myeloneuropathy associated with pancytopenia was made. The zinc was discontinued. Citaat: copper deficiency should be considered in cases of neuropathy after weight reduction surgery. Citaat: Copper deficiency should be considered in the differential diagnosis of multiple sclerosis, subacute combined degeneration of the cord, optic myeloneuropathy, post-gastric reduction surgery neuropathy, or in other cases of myelopathy, optic neuropathy, or polyneuropathy where nutritional deficiency or overuse of zinc supplementation is suspected. Citaat: With the first onset of paraesthesiae in December 1998 parenteral administration of Vit. B12 (1000 µg/week) and folic acid (5 mg/week) was initiated despite a normal Vit.B12 serum level of 329 ng/l (199–732 ng/l). Prophylactic parenteral medication over 18 months did not affect the severe disease progression: paraesthesiae of the upper extremities advanced to an the incomplete transversal syndrome with severe spastic tetraparesis. Citaat: Serum ceruloplasmin was decreased (110 mg/l,normally 200–500 mg/l) as was serum Cu++ (308 µg/l,normally 760–1800 µg/l). CSF analysis showed a decrease in Cu++ (4.9 µg/l,r ef. 6–35 µg/l),which excluded Wilson’s disease in which CSF copper is increased . We made the diagnosis of copper deficiency-associated myelopathy after gastrointestinal resection with impaired copper absorption and consecutive ceruloplasmin deficiency. Citaat: The hematologic relevance of copper and microcytic anemia and neutropenia (as observed in our patient) secondary to copper deficiency is well established; they can be caused by intestinal malabsorption secondary to gastrectomy . Citaat: Copper is a trace metal essential for the activity of key enzymes involved in haematopoiesis and in the structure and function of the central nervous system (CNS). Acquired copper deficiency with neurological features is a recently recognised disorder  that still constitutes an under-recognised cause of myelopathy , with signalintensity change in the dorsal columns of the spinal cord at magnetic resonance imaging (MRI) that resembles those of myeloneuropathy due to vitamin B12 deficiency . Citaat: Vitamin B12 and folate levels were normal at 470 pg/mL (211–911 pg/mL) and 16.40 ng/mL ([3 ng/mL), respectively. A slight reduction of serum vitamin E to 15413 nM (normal 17511–30522) was found. Antinuclear antibodies and antibodies against extractable nuclear antigen, gliadin, endomysium, gastric mucosa, transglutaminase were negative. Serum copper and caeruloplasmin levels were significantly low at 162 lg/L (600–1,370 lg/L) and 12 mg/dl (20–60 mg/dl). 24-h urinary studies showed a reduced copper excretion rate\1.1 (4.2–50). Citaat: Spine MRI in our patient demonstrated increased T2 signal intensity in posterior columns, as reported by others [2, 3, 5, 7, 11, 12], a pattern similar to the subacute combined degeneration of vitamin B12 deficiency . Citaat: Unexplained anemia or leukopenia in association with neurologic manifestations should prompt clinicians to check serum copper concentrations in addition to vitamin B12 levels. Serum copper levels should be checked in all patients with a hematologic syndrome that suggests sideroblastic anemia or myelodysplastic syndrome, particularly with accompanying unexplained neurologic symptoms. Myeloneuropathy mimics the subacute combined degeneration seen with vitamin B12 deficiency, and copper and vitamin B12 deficiency may coexist. Copper deficiency should be considered even in the absence of an obvious cause. Citaat: Roux-en-Y gastric bypass (RYGB) surgery for morbid obesity is becoming increasingly common in the United States; most procedures bypass the duodenum and between 100–200 cm of proximal jejunum – the sites of most copper absorption in humans 7, 16–17. RYGB patients are routinely prescribed multivitamin-mineral preparations, iron, calcium and vitamin B12, but copper is not routinely supplemented as a specific nutrient and little information on copper depletion after RYGB is available 6–7. We here report two patients followed prospectively by all of the authors in both the inpatient and outpatient setting at Emory University Hospital and The Emory Clinic. The patients each presented more than ten years after RYGB with severe gait abnormalities, anemia and severe neutropenia in association with severe copper depletion. The hematologic indices rapidly normalized with copper intravenous and oral repletion, but the neurologic deficits and symptoms showed only modest improvement over a several month period of observation. Citaat: Her past medical history included RYGB surgery for morbid obesity approximately 21 years prior to presentation but no other significant past medical history. She received 1000 µg vitamin B12 subcutaneously monthly for many years, but otherwise received no vitamin or mineral supplementation. Citaat: After the initial evaluation failed to identify an etiology, the patient was referred to the Winship Cancer Institute of Emory University, where an extremely low serum copper concentration of 4 ug/dL (normal = 80–155 ug/dL), and ceruloplasmin concentration of 3 mg/ dL (normal = 21–53 mg/dL) were identified. Citaat: She received 400 µg vitamin B12 subcutaneously monthly for many years, but otherwise received no vitamin or mineral supplementation. Citaat: Blood platelet count, iron studies, folate, vitamin B12, homocysteine and thiamine concentrations, and syphilis serologies were within normal limits..... Further laboratory examination demonstrated that the patient was markedly copper deficient, with a serum copper concentration of 2 ug/dL and a serum ceruloplasmin concentration of 2mg/dL, respectively.